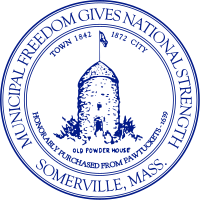 Somerville (/ˈsʌmərvɪl/ SUM-ər-vil) is a city in Middlesex County, Massachusetts, United States. It is directly to the northwest of Boston. As of 2010, the United States Census lists the city with a total population of 75,754 people, making it the most densely populated municipality in New England. As of 2010, it was the 16th most densely populated incorporated municipality in the country. It was founded in 1842, when it was separated from Charlestown. Cartoonist Paul Ryan and football player Howie Long were born here. Wikimedia Commons has media related to Somerville, Massachusetts. This page was last changed on 21 June 2018, at 16:27.